Hansen’s long run started with the 2011 Vuelta a España, which he finished 129th. After completing the 2015 Vuelta a España, his 13th grand tour in a row, he broke the Spanish cyclist Bernardo Ruiz’s (born January 8, 1925 in Orihuela) 57-year-old record for consecutive grand tours completed. Ruiz is also winner of the 1948 Vuelta. Hansen also won two stages: in 2013, Hansen broke away early in the seventh stage of the Giro d’Italia, a stage featuring numerous short and steep climbs. Hansen shed his breakaway companions and won in solo fashion in Pescara in pouring rain, more than a minute in advance of the chasing group. In stage 19 of the 2014 Vuelta a España, Hansen attacked the peloton with 4 km to go and resisted to the disorganized chase to win solo. 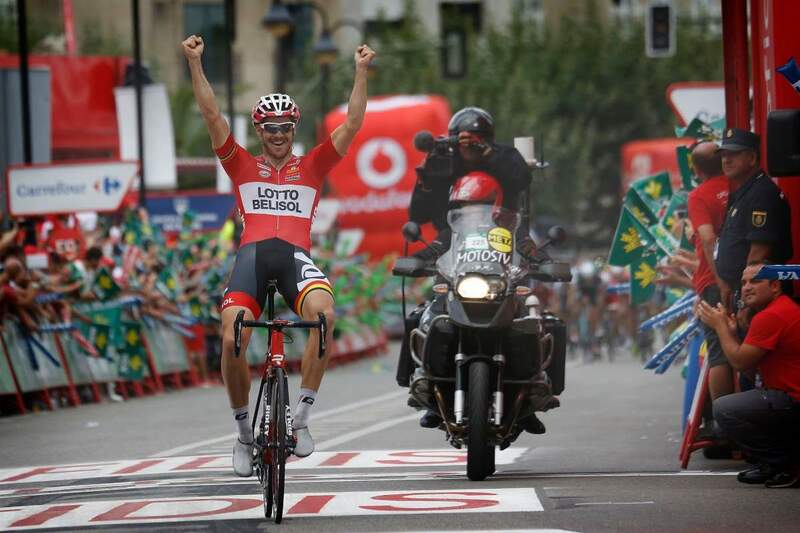 Adam Hansen wins stage 19 of Vuelta a España 2014. Lotto Belisol animated the nineteenth Vuelta stage, between Salvaterra do Miño and Cangas do Morrazo. Hansen jumped away at less than five kilometers from the finish and won.